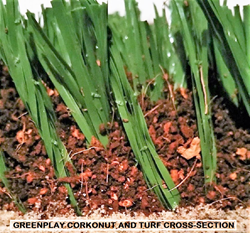 Greenplay’s plant-based, organic Corkonut infill takes artificial turf to another level with grass-like performance, low abrasion, low field temperatures and minimal fly-out while promoting safety and an environmental stewardship with a 100% natural and recyclable product. Artificial turf with Greenplay® organic Corkonut infill provides optimal performance and safety to alleviate concerns raised from the parents and community. In November of 2015 Senators Richard Blumenthal for Connecticut and Bill Nelson for Florida requested that the Consumer Product Safety Commission (CPSC) conduct an investigation on the safety of the crumb rubber infill typically used in athletic fields. In January of 2016, the city of Hartford included article 6.3.3 B in their zoning regulations stating that the use of artificial turf containing synthetic infill materials shall be prohibited. Safety concerns continued to escalate, prompting the same two senators to write a letter to then President Obama asking for the funding to commence a comprehensive, interagency federal study on the potential health risks of playing on artificial turf fields with crumb rubber. The funding was granted and the study involves cooperation between the Environmental Protection Agency, the Centers for Disease Control and the Consumer Product Safety Commission. The results of the federal study have yet to be published and thus far no public policy or health risk warning has been declared. The new state of the art turf field will be based on Sprinturf’s Ultrablade Dual Fiber Extreme turf with an industry exclusive fiber blend of 120-micron slit film and 330-micron monofilament fibers. Combining the turf with Greenplay organic Corkonut infill provides the best possible scenario to alleviate any health or safety concerns in the community. Greenplay puts the nature back into turf for ultimate performance, safety and environmental responsibility. It is the perfect turf infill for all sports applications, recreational areas, playgrounds, landscapes and compatible for use with any turf that requires infill. It is successfully utilized nationally in over fifty fields with diverse regions and climates. For more information, visit http://www.greenplayusa.com or contact the office by phone at 516-223-0202.